Medal of Honor coin – 100 years in the making. It happened nearly 100 years ago, during WWI, at a battle between the Germans and Americans on the Vesle River, near the town of Bazoches. During a fierce 3 day fight, beginning on August 7, 1918, US and Allied Forces faced the German army on this field in France. American soldiers emerged from trenches dug in the field to advance on the German army. Many were shot and laid injured on the battlefield – unable to climb back to safety. Three times, under heavy gunfire, a young soldier from New York, Sgt William Shemin, ignored his own personal safety to climb out of the trenches. He carried Americans injured and fallen on the battle field back into safety. He continued this rescue until he himself was injured. It was not until June 2, 2015, that Sgt Shemin’s actions were recognized and he was awarded our country’s highest military distinction – the Medal of Honor. 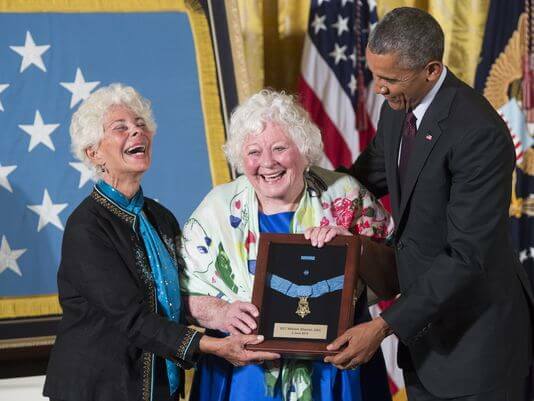 At a White House ceremony, President Obama presented the Shemin Family the Medal of Honor for the actions of their father, Sgt William Shemin, during the Battle of Bazoches. 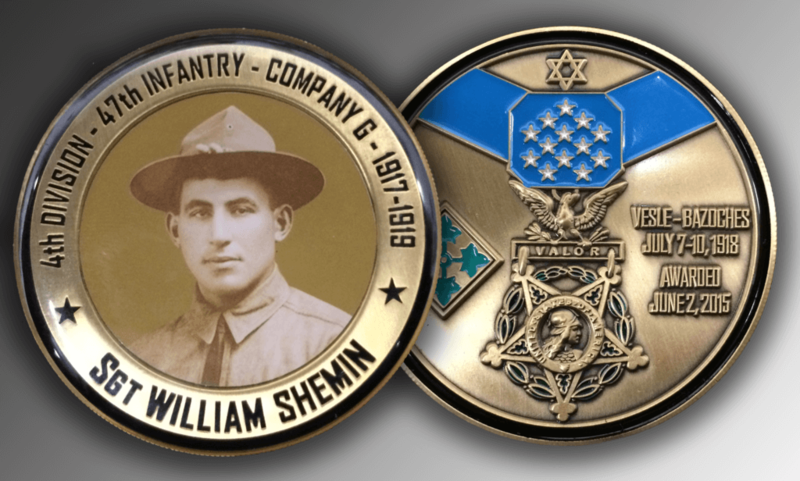 We were contacted by Elsie Roth-Shemin and Richard Shemin, MD, and asked to create both a challenge coin and a lapel pin for the family and close friends of Sgt Shemin. It has been our distinct honor to work with the family and to design and manufacture a unique coin and pin recognizing the valiant actions of their father.